A true man is the man who dares to live up to God's design. Men, within you there's a man God wants to release: a man of confidence, purpose, strength, destiny, consistency, sensitivity, accountability, and loyalty-who is spiritual and loving. A problem solver and a leader. Within you is a true identity waiting to be fulfilled. When that true man appears, you'll realize that responsibility is not something to run from, but rather something to be embraced. You'll learn that sovereignty can happen only when you become obedient to God. You'll see that your relationship with the family you create isn't about limitations, but about freedom. Only when you become that true man can you make yourself ready for the woman who loves you. Women, you have long been misled about what a real man is. You don't know what to look for or expect in a partner, so you have unrealistic expectations and unmet needs. The truth is, you demand what men can't and shouldn't give you, yet you don't allow men to embody the role that God has called them to. Bishop Evans wants to show you how to identify a man who lives up to God's design, and teach you how to foster the spiritual growth of the men in your life. 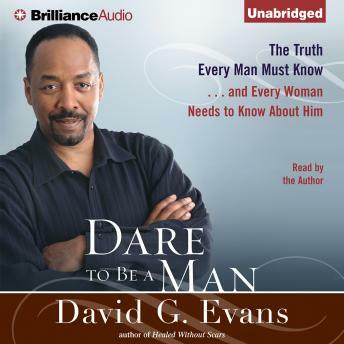 With its inspiring and empowering message, and its practical applications, Dare to Be a Man is essential listening for all men and for the women who love them.